I’ve been bike riding for a few years now, sick slowly getting new gear and equipment as my abilities increased. I find bike riding a good blend of exercise and geeking out on gear. I enjoy riding and seeing the sights, and getting outside is always nice. And getting new toys to put on my bike is always fun too. So yesterday I put my aero bar back on my bike, I don’t remember why I took it off (here’s an article on why I might have, stability is an issue), but I recently read that using an aero bar is good for your core, so I decided to try it out again. I also decided to try out an iPhone app called Trailblazer (iTunes web link). Jeff found this one and said it was pretty cool, so I grabbed it, since it’s free it can’t hurt! 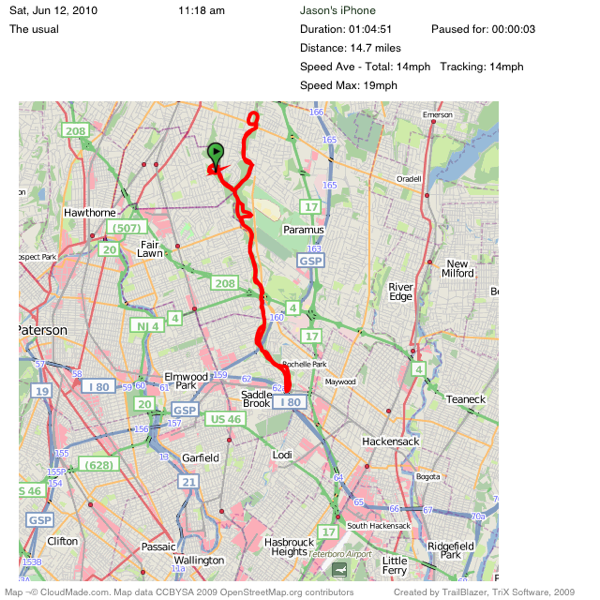 Trailblazer basically records your GPS position during your bike ride. It also has other features like iTunes control, and charting where you are on a map (would be useful if you got lost), speed graph, and altitude graph. None of those were particularly useful to me since I keep my iPhone in my pocket while riding. But I’d love to get a handlebar mount in the near future. To compare what data Trailblazer provides, I’ll compare it to the bike computer I use, a Sigma 1606. I just set this up again when I replaced the battery, so I know that the wheel settings and all that crap are correct. From this map you can see that Trailblazer thinks I rode for 1:04, went 14.7 miles, had an average speed of 14mph, and a top speed of 19mph. Unfortunately the only thing correct about this data is the time it took. The other data isn’t totally wrong, it’s just lower than what the bike computer says. 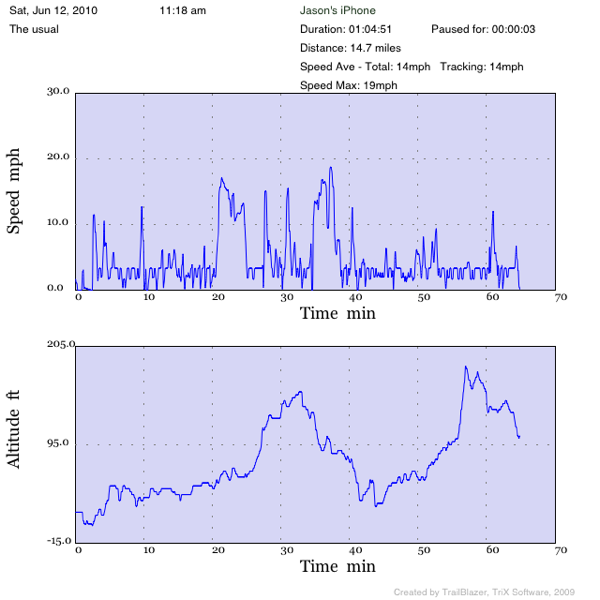 My bike computer reports that I rode for 1:01, went 15.57 miles, had an average speed of 15.13mph, and while I didn’t clear out my old max speed, I know I was going above 19mph at various times during the ride, I know I saw 21mph at least once. But what about the charts that Trailblazer gives you? Well I couldn’t find a way to look at them on the phone, but Trailblazer offers a way for you to export the ride, either emailing it to yourself, saving it as a set of pictures, or uploading it to facebook. I couldn’t get the facebook export to work until the next day, but I’m going to assume that’s an issue with my phone, and not the app. When I emailed myself the ride, the charts came with it. Now the speed plot I would just throw in the garbage. Maybe it’s because the phone was in my pocket so it’s accelerometer was all over the place, I don’t know. Either way it’s wrong. The altitude one also seems weird. I mean, I start and end at the same place, so shouldn’t the altitude at the start and end be the same? Probably the coolest feature of Trailblazer is the export data as a KMZ file that you can then import into Google Earth. I don’t know why it’s cool, but it is. I imported it and then just scrolled around it for a few minutes saying “yeah i was just there”. haha. One last note, I rode for an hour, and my iPhone battery was pretty much full when I started. When I ended it had been drained by about 50-60%. I know the GPS drains your battery, but I was also playing music the whole time, so I’m not sure how much more of an effect that had on the battery. This could be an issue for people who ride longer than an hour or so. All-in-all, Trailblazer is free, so even if the only thing you use it for is to map your ride, then it’s worth it. I enjoy bike riding, but I also enjoy looking at what I’ve done, what I’ve accomplished, where I’ve been, so any piece of hardware or software that helps me do that I’ll try out.